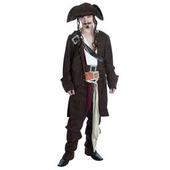 Blackbeard The Pirate Costume, become the terrifying captain of the ship 'The Queen Anne's Revenge' . 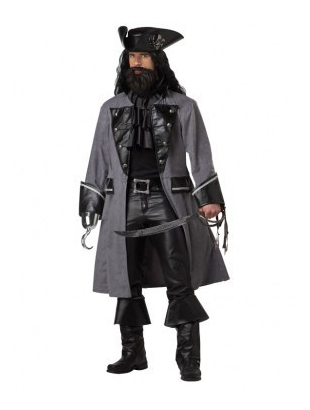 Costume features a deluxe, long grey pirate coat complete with black detailing on the cuffs, pockets and collar and a matching black jabot. 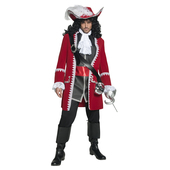 Also included in this pirate costume is a black buckled belt and a pirate hat with skull detailing to complete the look. 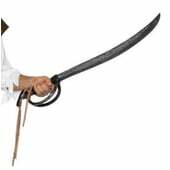 Please note that the sword, hook and boots covers are not included but can be purchased separately on our site. 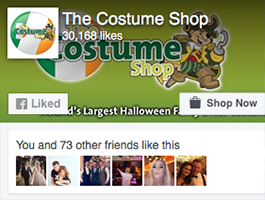 Why not add a moustache and beard to complete the look pictured!